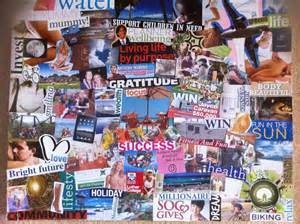 I created my first vision board, many years ago, after I sold my Healing Center and Vegetarian Restaurant and moved to Eugene. 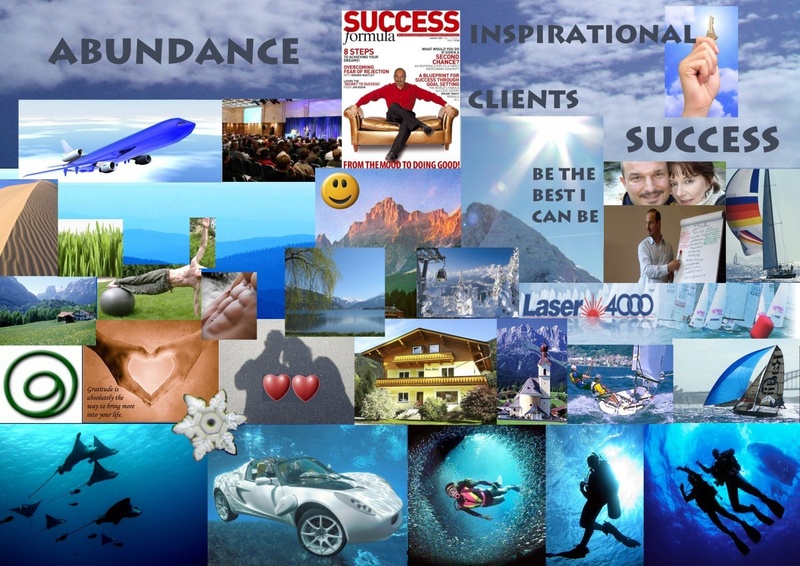 The movie “The Secret” had just been released and I decided to create my own Vision Board. When my board was done, I had it hanging in the living room for a while but somehow it disappeared and a few years later I found it behind a heavy book case when we were painting the house. I was quite shocked when I found my vision board six years later and everything that was on the board had actually happened in my life. The problem was that the items on the board were somewhat unclear and I knew I had to create new board with much more clarity and vision. I was so surprised, that I felt inspired to learn more about the law of attraction and how this really works. After my partner Chris passed away I took two years of my life to write “The Seven Insight” , Quantum Transformation – a workbook for people who want to see massive transformation in their lives. While writing my book, I learned that deliberate creation is not about sitting around and visualizing what you want. While creating a vision is important for some, vision, in and of itself, isn’t what creates our outcomes. That is because aligning gets us into the feeling state of what we most desire and feelings (aka vibration or energy) are what is actually attractive. It doesn’t matter how you do it. Maybe it is by cutting and pasting images onto a poster board, by visualizing, by writing, or by dancing naked in your living room. So, the real practice then, is to deliberately generate your most desires feelings and then take actions that are inspired from those feelings. That way, not only do you get to feel how you want to feel now, but you also bring more of that feeling into your experience. *Some of my favorite magazines are Oprah, The Simple Things , Law of Attraction , Yoga Journal, Body + Soul, Afar. I also love to get Luxury Real Estate Magazines as well as high fashion magazines as they usually have the best fonts! Also note that you can do this style of vision board in a blank art book (this one is my favorite) or a binder. I like to either do the book/binder thing or a cork board. 2. Find a space that is large enough to spread out all of your supplies. A large table or the floor are usually great choices. 3. Decide what area of life you want to focus on and think about how you want to feel (for example: free, open, loved and accepted) in that area. 4. Get comfortable and relaxed. Choose music, light candles, burn incense, chant, gather your crystals, sing to your angels, bang drums, or anything else that supports you in feeling comfortable and relaxed. 5. Flip through the magazines and begin tearing/cutting out images/words/phrases that appeal to you. At this stage, it doesn’t matter if it matches the are of your life that you are exploring. For now, just focus on any image, word, etc. that feels any kind of good to you when you look at them. 6. Now, go through your images and look specifically for things that generate your desired feelings related to the area of life you are focusing on. If you want to feel “free,” select images that invoke “free” feelings for you. Don’t choose images that feel crappy when you look at them. Set aside any images that still feel good but don’t quite fit on your current board. I like to keep mine in a pretty hatbox in my office. 7. Once you have the images you want to use, do a “dry run” by arranging the images and words in a variety of ways. When it feels just right, go ahead and affix your images to your board. You may want to consider creating additional elements using paper and markers, etc. 8. Look at your board often and focus on the feelings that looking at the images creates for you. Pay attention to how they feel in your body. Remove and add images as needed (this is why I like the cork board or books, much easier to remove the unwanted and add in). 9. When you’ve really amped up those feelings in your body, take action that is inspired from already having the experience of your desired feelings. If your desired feeling is free, what action are you inspired to take when you feel free. Do that. When you align yourself with the feelings you want before acting, not only do you manifest more of what you really desire, but you also get to experience those feelings now. And isn’t what what we really want, anyway? Want more posts like this one + free classes delivered straight to your inbox? Click here.